Who are the Magna Carta Surety Barons? That is all there were ~ twenty-five Barons who stood against King John and his greediness and bloodthirstiness, and together they made an oath to enforce Magna Carta. That is why they are called the Surety Barons of Magna Carta. Though I am a member of the Magna Carta Project, at WikiTree that doesn’t mean I have all the answers, by any means. Even I had questions when I first became involved with the project. In my study of the Magna Carta and the Barons, I became intrigued by the story of Maud (Matilda) de St. Valerie, who was starved to death in a dungeon, together with her eldest grown son, because King John had learned of her remarks against him. Remarks mind you – not even deeds. There was a very great need for the law to cover not only the peasants, gentry, and Barons, but the King as well. King John in 1205 quarreled with then Pope Innocent III about who should be Archbishop of Canterbury. King John would not allow the Pope’s representative to set foot in England, and for this the King was excommunicated. This was a bit harsh, even for King John, and he later made amends. However, the Pope continued to demand money of the King and his people. But King John’s answer, in order to pay these and other demands, was to levy taxes that were exorbitant , and extortionate . His reprisals against defaulters were ruthless and his idea of justice was avaricious . One of King John’s acts to regain lost lands of Aquitaine, Poitou and Anjou was to tax the Barons. A bitter quarrel broke out over the methods used to levy those taxes. 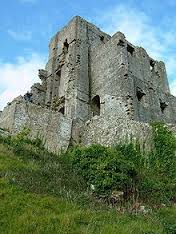 It was then the Barons realized other ways had to be considered in order to curb the King and to force him to govern his people by the old ways, the “old English laws” that were in place prior to 1066 . When all else failed, the Barons went to war against King John, and captured London in May 1215. By June of that year they took King John by surprise at Windsor and forced him to a meeting at Runnymede. 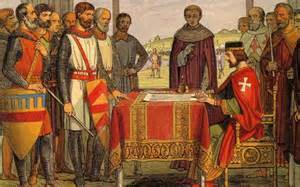 King John signed and sealed the Magna Carta on June 10, 1215. The Barons signed their own agreement to enforce it. • Maud (Matilda) de Braose. @Wikipedia. Accessed 30 January 2015.